Not my grandfather's -- found it on Wiki. I don't remember much of Monday, but likely more than my grandfather does. I didn't sleep much, as expected. We got him to the hospital, filled out his forms, waited with him while he was briefed on all the things. It was odd seeing someone else get the hospital gown and the yellow slipper-socks. And very odd to see all the changes that have gone into effect since my last surgery five years ago. The hospital where all my surgeries took place has a massive new pavilion. There's a bistro -- breakfast and lunch all day. I got a club baguette too big for me and split it with my uncle, and tried to deal with the tea they had on hand. 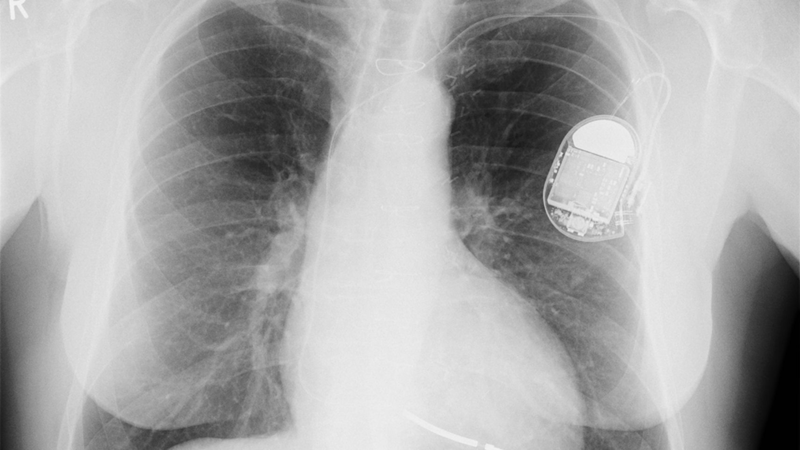 It's funny -- pacemakers are pretty run-of-the-mill anymore, but there's still the worry. You get one in a million situations. Maybe this will be that one. Charlie left me with his wallet before he went into surgery (or rather "the procedure"). You know. Just in case something happened. Having the bulk of the wallet on me was terrifying. It was like carrying around a physical manifestation of that Just In Case fear. I like this hospital. I like the people there. So my fear wasn't to do with the skill of anyone involved. Just "A family member is having surgery" paranoia, minus the anesthesia I always got so everyone worried while I slept. We had snacks while we waited. Showed each other silly memes. And, of course, everything turned out just fine. We got the pacemaker equipment as Charlie finished waking up and learned how it all worked. Bluetooth. And very Black Mirror looking. I felt for a moment like I was putting myself in for something akin to "Arkangel" given the slick look of the monitor, but no such thing. Charlie is excellent now. He's got some slight pain on the incision site, but that's to be expected. I can already tell he's doing much better energy-wise. Now he's trying to find a way to track his pacemaker's information online. I'm wondering if he'll have hacked the monitor and turned it into a pet or something before the week's out. Thanks so much to everyone -- the people I know and the people I barely know -- for the kind thoughts and well-wishes. I'm not sure Charlie knows how many fans he has via my posts and stories. But it was much appreciated and we felt the love. And he'll be around to give me plenty more weird stories to tell you all.